Director – Danny Lerner, Story – Danny Lerner & Les Weldon, Producer – Les Weldon, Photography – Ross Clarkson, Music – Steve Edwards, Visual Effects Supervisor – Scott Coulter, Visual Effects – Worldwide FX (Supervisor – Danail Hadzhiyski), Special Effects Supervisor – Ivo Jivkov, Pyrotechnics Supervisor – Vasil Dikov, Production Design – Carlos Da Silva. Production Company – Nu Image/Tosca Pictures/Venice Sharks Inc.
David Franks, an American lecturer in oceanography, receives notice that his father has gone missing while diving in Venice. David flies to Venice with his fiancee Laura. Examining the bodies of his father’s two companions, David believes that they were killed by sharks. 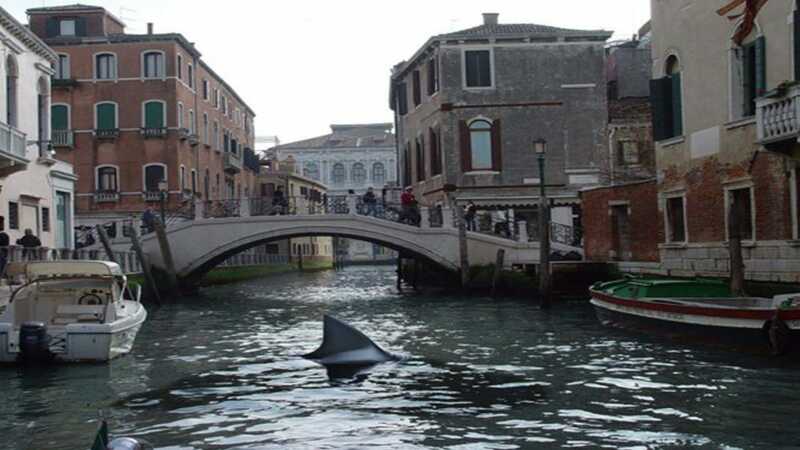 However, the local police ridicule the notion that there would be sharks in the canals of Venice. Among his father’s papers, David discovers information that shows he was searching for the lost treasure of King Solomon that was supposedly discovered by the Medicis during the 13th Century and hidden somewhere in Venice. Diving where he believes his father to have disappeared, David discovers the location of the treasure. Local Mafia head Vito Clemenza, the one who has placed the sharks in the canals, then abducts Laura and demands that David lead him to the treasure. Meanwhile, the sharks emerge into the canals and start attacking people. It is almost certain that Shark in Venice was made not long after the success of Snakes on a Plane (2006), which set out to create an animals amok movie with its tongue planted in cheek. This in turn gave birth to a string of absurd and/or tongue-in-cheek titled low-budgeted monster movies with the likes of – see the likes of Mega Shark vs Giant Octopus (2009) and sequels, Dinoshark (2010), Sharktopus (2010), Sand Sharks (2011), Snow Shark: Ancient Snow Beast (2011), Swamp Shark (2011), 2-Headed Shark Attack (2012), Jersey Shore Shark Attack (2012), Jurassic Shark (2012), Avalanche Sharks (2013), Sharknado (2013) and sequels, 90210 Shark Attack (2014), Raiders of the Lost Shark (2015), Roboshark (2015), Shark Exorcist (2015), Zombie Shark (2015), Ice Sharks (2016), Planet of the Sharks (2016), Sharkansas Women’s Prison Massacre (2016) and Trailer Park Shark (2017), among others..
Shark in Venice comes from Nu Image, a US based company that started in the 1990s making a series of low-budget action films. These have included several different series of films including Cyborg Cop (1993) and sequels, the Project: Shadowchaser sequels, Operation Delta Force (1997) and sequels, the Nature Unleashed series of disaster movies. From the late 1990s onwards, Nu Image have also been prolific in terms of producing low-budget CGI monster movies with the likes of Crocodile (2000), Octopus (2000), Spiders (2000), Rats (2003), Larva (2005), Mansquito (2005), The Snake King (2005), Kraken: Tentacles of the Deep (2006), Gryphon (2007), Mega Snake (2007) and Flu Bird Horror (2008). The first and one of their most popular monster movies was Shark Attack (1999), which has produced two sequels, as well as had its footage rehashed in one further film Shark Zone (2003). Nu Image have also made other shark-themed works such as Hammerhead (2005) about a genetically engineered human-shark hybrid, and Raging Sharks (2005), which mixes shark attacks with the discovery of an alien ship. In more recent years, Nu Image have been making a bid for more respectable cinematically-released markets with works like Rambo (2008), Bad Lieutenant – Port of Call: New Orleans (2009), The Expendables (2010), Conan the Barbarian (2011), Drive Angry (2011), Olympus Has Fallen (2013) and Texas Chainsaw (2013), most of which are cannily based on revivals of well-known properties.Shark in Venice is directed by Israeli-born Danny Lerner, the brother of Avi Lerner, the founder of Nu Image. Danny has been producer on a great many of Nu Image’s films and has directed eight films for them beginning with Traitor’s Heart (1999) and including Shark Zone, Raging Sharks and other animal-based films such as Finding Rin Tin Tin (2007) and Cool Dog (2010). It is more than apparent that Nu Image have made Shark in Venice as cheaply as possible. Danny Lerner gives the impression that he has either shot all the shark scenes in an oceanarium or employed stock footage – at no point is any attempt made to place the actors (or even stand-ins) into the same shots with the sharks. Instead, the film uses frenetic editing during these scenes to blur what is happening together in the hope that this will convince us the actors are being attacked by sharks. The brief handful of visual effects shots where we see the sharks emerging into the Venetian canals – where a drunken man is snatched off a landing or a shark bites a gondola in half – are laughably shoddy. In fact, the sharks appear so seldom that the film acts more as a work about a treasure hunt and Stephen Baldwin’s problems with the Mafia than it does as an animals amok feature – the actual CGI shark appearances amount to no more than a minute’s worth of screen time. If nothing else, the film does make effective use of the Venetian locations. The city radiates a presence that goes beyond the tatty production values. Yet for all the use of the location and the film’s title, Shark in Venice was is in fact shot in Bulgaria, one of the prime world locations for el cheapo filmmaking – most of the Venetian footage would appear to be second-unit filler. If nothing else, Shark in Venice is an animals amok movie with pretensions – one stretches to think of any other monster movie that features classical opera on the soundtrack (presumably on the association that the Venetian setting means opera). Crucially, what is missing in all of this is any of the tongue-in-cheek attitude that made Snakes on a Plane work; everything is played po-faced and seriously. The shark elements follow the playbook of Jaws (1975) cliches and add nothing to them – other than perhaps the absurdity of the scheme that has the sharks placed into the canals by a local Mafia head for the purpose of keeping people away from the treasure that he is himself searching for. For some reason, the shark menace plot is not enough so the film also adds a treasure-hunter element with Stephen Baldwin acting as a cut-price Indiana Jones knockoff and having to traverse a cave of cheap-looking traps. Added to this is the idea of the treasure of King Solomon borrowed from H. Rider Haggard’s oft-filmed King Solomon’s Mines (1885). 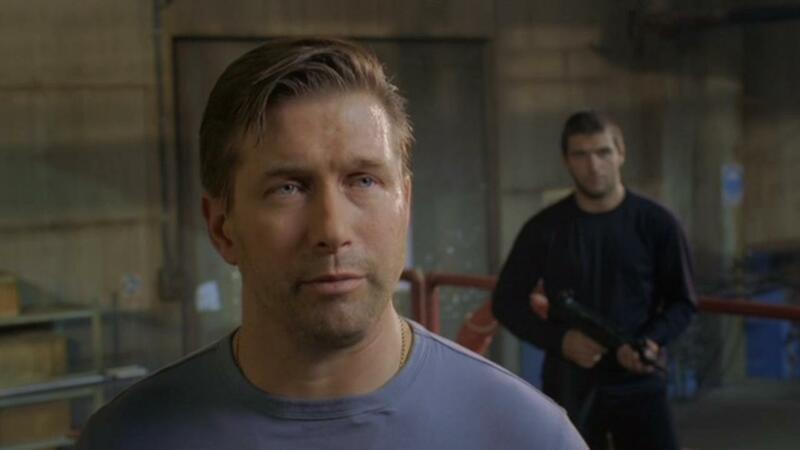 There are some lame action sequences with Stephen Baldwin trying to convince us he is an action man and pursuing/fleeing from Mafia thugs through the streets of Venice. Shark in Venice often gives the appearance of being so low-budgeted that it had to make do with the siblings of more well-known actors such as Stephen Baldwin, one of the lesser-known Baldwin brothers, and Vanessa Johansson, the unknown sister of A-lister Scarlett Johansson. The film’s low expectations are further hamstrung by Stephen Baldwin, who has spent a career eking out roles in B-budget action movies, tv movies and other Nu Image productions. (These days Stephen is a Born Again Christian and works as part of a ministry that preaches to youth via extreme skateboarding!) The film’s credibility sinks the moment that we are introduced to Stephen Baldwin and are expected to take him seriously as an academic. Stephen strains to act intently serious but only gives off a posed performance that signals that that is what he is doing in quote marks – his attempt to play out fight scenes is woeful. As the Mafia villain of the show, Giacomo Gonella plays like a bad parody of a 1970s Italian super-stud with shirt open to reveal a hairy chest. Indeed, Gionella’s amazingly bouffed hair ends up being the star of the show.